When I was a kid, Joe, I used to have a dream. I was locked up overnight in a pastry shop, and there was goodies all around. There was jelly rolls, and mocha eclairs, and sponge cake and Boston cream pie. Boston cream pie– not a pie, not cream, and probably not from Boston. Boston cream pie consists of two layers of either yellow butter cake or sponge cake sandwiched with vanilla pastry cream and topped with a soft chocolate glaze. The combo of cake and pastry cream filling dates back a century and a half. The now standard covering, however, is a relatively late addition as, until the late 1940s, the cake was usually bare or simply sprinkled with confectioners’ sugar. With the affixing of the chocolate glaze, Boston cream pie turned into one of America’s best known and favorite treats. The “Very Nice Custard Cake” in the March 29, 1866 issue of The Cultivator & Country Gentleman (Albany, NY) consisted of an egg-foam cake (rather coarse and dry) filled with a pudding-like lemon custard: “Three eggs – one teacup powdered sugar – one and one-half cups of flour – teaspoon of cream tartar – half a teaspoon soda – little salt. The Custard – one pint of milk – teacup sugar – two eggs – two tablespoons of corn starch – flavor with extract lemon. Make two loaves. When the cake is nearly cold split it, and fill with the custard. Try it.” Buckeye Cookery by Estelle Woods Wilcox (Minneapolis, 1877) referred to a similar egg-foam version with a little butter in the batter (rendering it more like genoise) as “‘Just Splendid’ Custard Cake”; however the starchless filling was made with ground almonds. The recipe for “Custard Cake” in Mrs. Porter’s New Southern Cookery Book (Philadelphia, 1871) – immediately preceding “Cream Puffs” in the book – was a butter cake filled with lemon pastry cream. The “Washington, or Cream Pie” in The Godey’s Lady’s Book Receipts and Household Hints (Philadelphia, 1870) was made from a yellow butter cake baked in “round jelly tins, and split when cold” then filled with pastry cream flavored with “lemon or vanilla” and directing “put together like jelly cake.” The Home Cook Book by Ladies of Toledo and Other Cities (Toledo, OH, 1876) distinguished between two recipes for “Cream Pie” consisting of pastry cream-filled sponge cakes (a third “Cream Pie” was an actual custard pie), and four recipes for “Custard Cake,” comprising three custard-filled (and a single pastry cream filled) yellow butter cakes. Mrs. Shaw’s Receipt Book and Housekeeper’s Assistant by Mrs. O.M. Shaw (Portland, ME, 1877) included a recipe for the famous “Parker House Rolls,” but only generic “Cream Pie,” consisting of two layers of butter cake with a vanilla pastry cream filling, but with no reference to either Boston or the Parker House or a chocolate topping. Already in the 1870s, some Americans began preparing a chocolate version of the filling, such as the “Chocolate Cream Pie” in the anonymous The Dessert Book: A Complete Manual from the Best American and Foreign Authorities by A Boston Lady (Boston, 1872). The earliest recipe using the name “Boston Cream Pie” and indeed the first actual record of the term I could find was in The Methodist Almanac 1872 edited by W. H. De Puy (New York, page 57): “Boston Cream Pie. 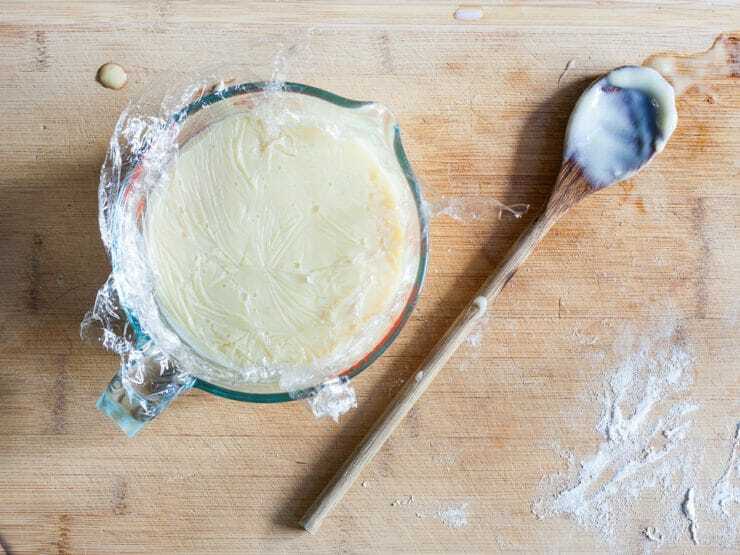 Cream part: One pint of new milk, two eggs, three table-spoonfuls of sifted flour, five table-spoonfuls of sugar. Put two thirds of the milk on to boil, and stir the sugar and flour in what is left. When the rest boils put in the whole and stir until it cooks thoroughly. When cool flavor with vanilla or lemon. 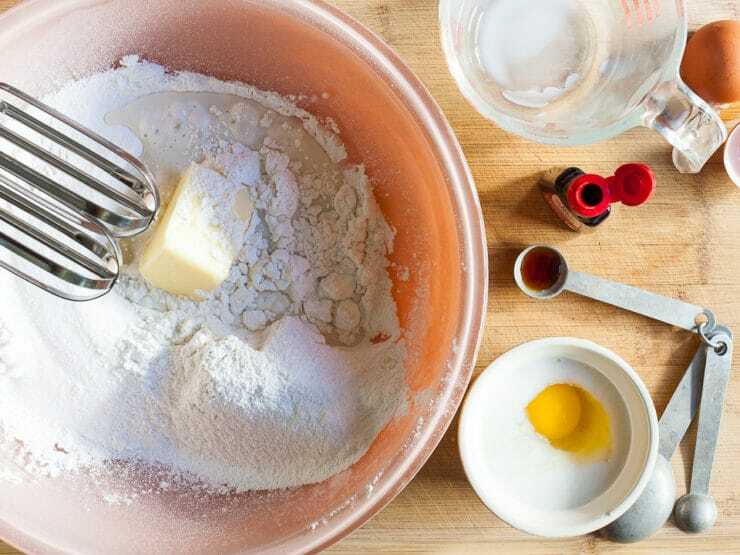 Crust part: Three eggs, beaten separately, one cup of granulated sugar, one and a half cups of sifted flour, one tea-spoonful of baking powder. Divide in half; put in two pie tins, and bake in a quick oven to a straw color. When taken out split in halves, and spread the cream between.” The cake batter is nearly identical to that of the “Custard Cake” in The Cultivator & Country Gentleman of 1866, while The Methodist Almanac substituted flour for cornstarch and offers a choice of vanilla or lemon flavoring in the pastry cream. At that point, “cream pies” were still without a topping – chocolate or otherwise. A rare early record of a chocolate-topped version was “Chocolate Pie” appearing in Melrose Household Treasure by a Committee of the Congregational Society (Melrose, MA, 1877), a yellow butter cake filled with chocolate pudding and covered with a rigid chocolate icing, the latter directing: “Two tablespoons of chocolate, one-half cup of sugar, white of one egg; beat the egg to a froth, add sugar and chocolate. Harden in the oven.” A decade later, the “Chocolate Cream Pie” in Miss Parloa’s Kitchen Companion by Maria Parloa (Boston, 1887), longtime food editor of “Good Housekeeping” and one of the first two directors of the influential Boston Cooking School, was closer to the modern concept of a Boston cream pie with a chocolate topping, but not with Boston in its name. Parloa’s treat consisted of three layers of butter cake baked in “deep tin plates” and filled with vanilla custard: “…spread a thin layer of chocolate icing over the cream. Place the other two cakes on top of the first two, and spread the remainder of the icing over them.” For the ensuing half century, the majority of Boston cream pie recipes omitted any reference to a chocolate topping. The “Washington Cream Pie” in The American Home Diet by E.V. McCollum and Nina Simmonds (Detroit, 1920) consisted of two thin sponge cake layers filled with vanilla custard and topped with white frosting and plain melted chocolate: “And when white frosting has cooled cover top with melted chocolate.” This is quite different from the now standard chocolate glaze. The 1948 edition of Toll House Tried and True Recipes by Ruth Wakefield (New York, 1948) -— a native of East Walpole, Massachusetts and inventor of the chocolate chip cookie -— mentioned, without including an actual recipe for Boston cream pie: “Toll House guests have been brought up on Richmond Chocolate Frosting [a cooked chocolate-pudding like frosting] which we use on Boston Cream Pie.” Wakefield called for a “Hot Milk Cake” (a baking powder sponge cake baked in a 7-inch square pan) as the base of her Boston cream pie. 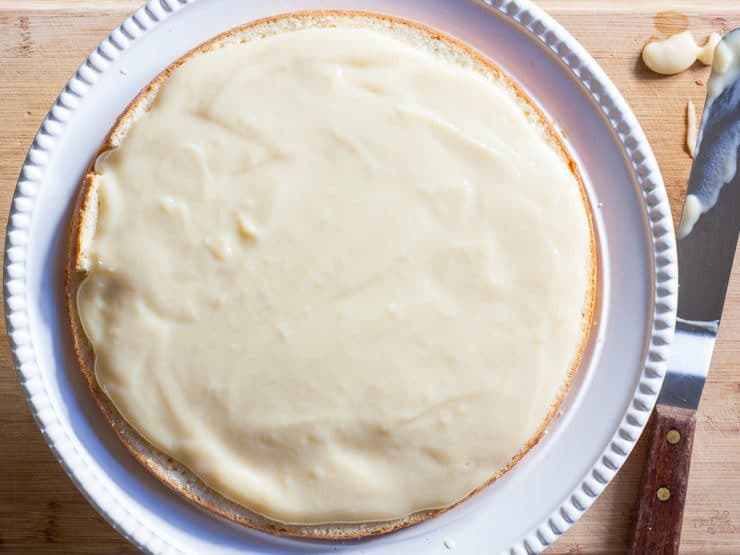 The modern concept of “Boston Cream Pie” using that name and replete with soft chocolate glaze was popularized and made the norm by Betty Crocker’s Picture Cookbook (New York, 1950), based on a one-egg butter cake baked in a nine-inch square pan. Subsequently, chocolate-topped versions made their initial appearance in newer editions of the venerable Fannie Farmer Cookbook and Joy of Cooking in the 1950s. Ganache (French for a “horse’s lower jaw,” but also slang for “idiot”), a simple, but intensely rich and flavorful chocolate and cream mixture, began appearing in American baking in the 1950s and grew increasingly popular over the years as a Boston cream pie topping. 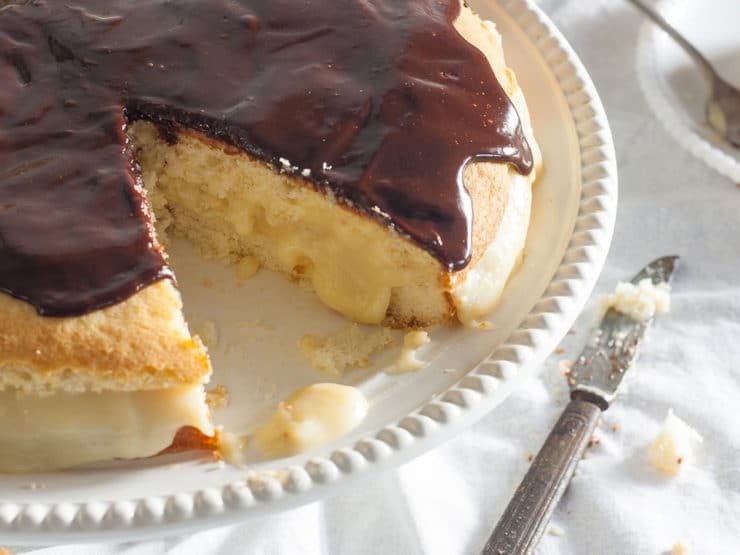 Boston cream pie emerged as an American icon. In 1958, Boston cream pie was the dessert served at the U.S. Exhibit at the Moscow Exhibition, made famous by the Khrushchev and Nixon debate on “freedom” in the kitchen on July 24. Also in that year, Betty Crocker released a Boston cream pie mix. Menus from the Kennedy White House commonly featured Rose Kennedy’s recipe for Boston cream pie (butter cake with pastry cream and chocolate glaze), a favorite of the Kennedy clan. On December 12, 1996, the Commonwealth of Massachusetts adopted Boston cream pie as the state’s official dessert. 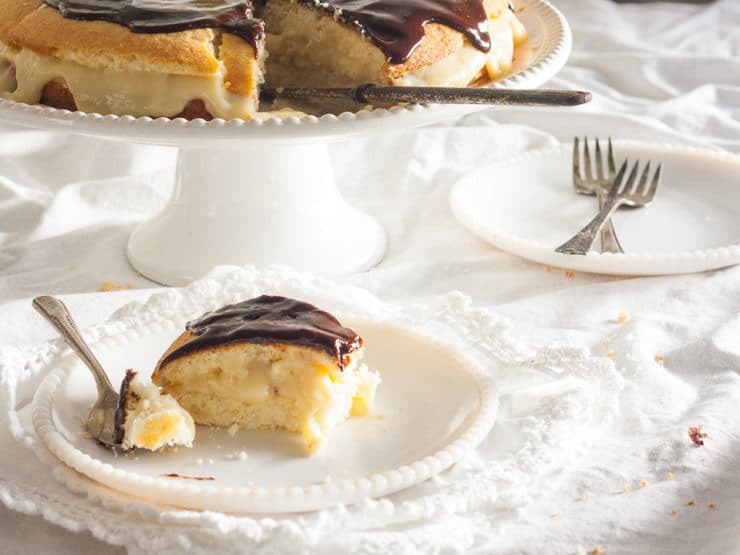 This triumph, over such formidable competition as the toll house cookie, Fig Newton, and Indian pudding, bespeaks the enduring popularity of Boston cream pie in particular and cakes in general. Frank Sinatra marked the occasion of his 82nd birthday on December 12, 1997 with his three favorite cakes -— banana, coconut, and Boston cream pie. And Old Blue Eyes was far from alone on opting for Boston cream pie for a birthday cake. Unlike many other earlier layer cakes that have disappeared, Boston cream pie can still be found at bakeries, restaurants, supermarkets, and school cafeterias throughout the country. October 23 is National Boston Cream Pie Day. A detailed history of the Boston Cream Pie, including a delicious classic recipe from food historian Gil Marks. In a 2-quart heavy bottomed saucepan, heat the milk, vanilla bean, and 2 tablespoons sugar over medium heat, stirring occasionally, until small bubbles appear around the edges. (The sugar helps to prevent the milk from scorching.) Remove from the heat, cover, and let steep until the vanilla infuses the milk, about 10 minutes. Remove the vanilla bean and return to a simmer. Meanwhile, in a medium bowl combine the remaining sugar, flour, and salt. Gradually stir in the warm milk. Return to the saucepan and cook, stirring constantly, over medium heat until the mixture bubbles, then boil for an additional 2 minutes. 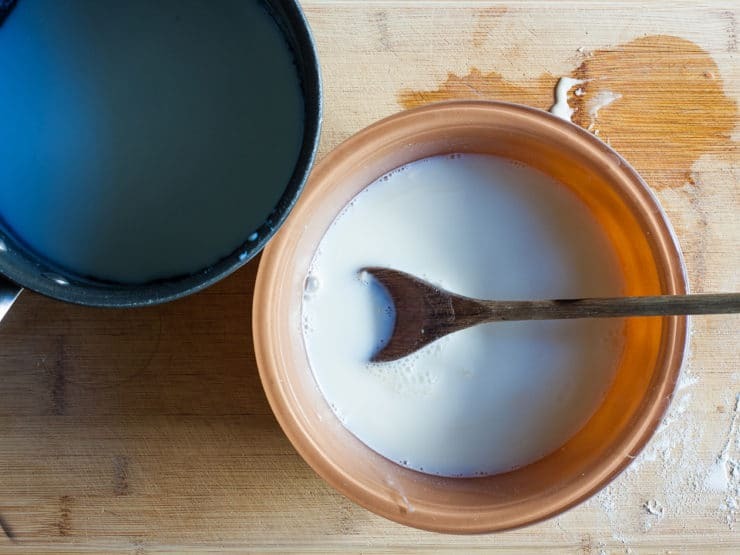 Remove the saucepan from the heat and gradually beat half of the milk mixture into the eggs. Scrape the egg mixture back into the saucepan, stirring constantly. 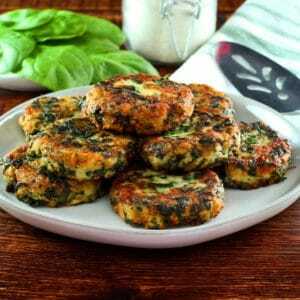 Cook over medium heat, whisking constantly until the mixture thickens or reaches 160°F, about 2 minutes. Remove from the heat and, if using, add the butter. 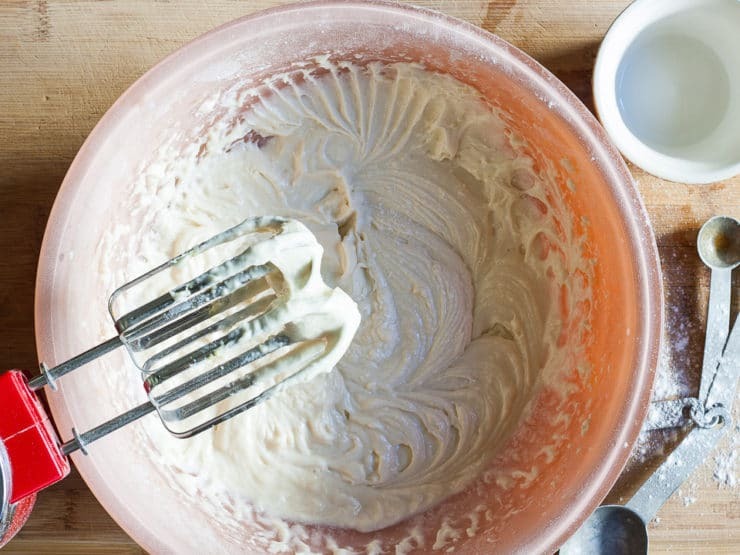 Continue to whisk for about 20 seconds, then pour into a bowl. If using vanilla extract and/or rum, add it now. Press a piece of plastic wrap against the surface and let stand at room temperature until cool, about 1 hour. The custard can be stored in the refrigerator for up to 3 days. Do not beat the cooled custard or it will break down. Position a rack in the center of the oven. Preheat the oven to 350°F (325°F for a convection oven). Grease two 9-inch round baking pans or one 9-inch springform pan, line the bottom with parchment paper or wax paper, grease again, and dust with flour. In a large bowl, combine the flour, sugar, baking powder, and salt. Add the butter, 1/4 cup milk, and vanilla. On low speed, blend together, about 30 seconds. Increase the speed to medium-high and continue beating for 2 minutes. Beat the egg with the remaining ½ cup milk. In 3 parts, beat the egg mixture into the flour mixture, about 20 seconds after each addition, until smooth. 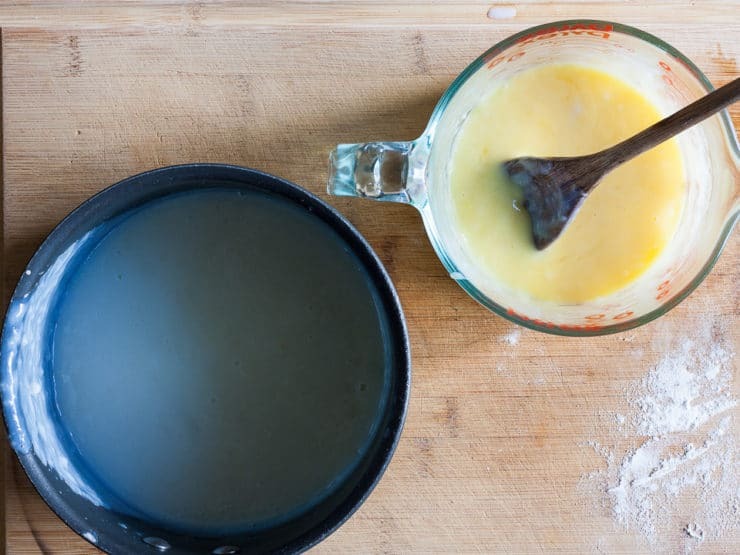 Divide the batter equally between the prepared pans. Bake until a tester inserted in the center comes out clean and the cake springs back when lightly touched, about 25 minutes for 2 pans or 30 to 40 minutes for a springform pan. 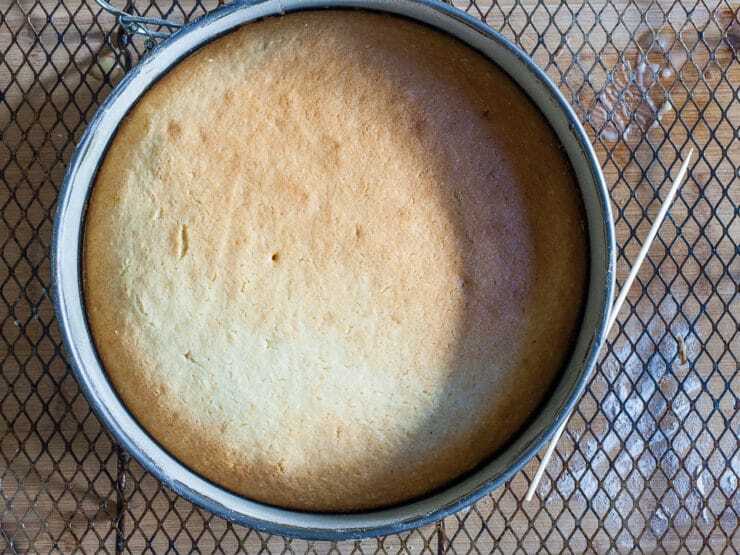 Let cool in the pans for 10 minutes, then remove the cake to a wire rack and let cool completely, at least 1½ hours. The cake can be wrapped and stored at room temperature for up to 3 days or in the freezer for up to 3 months. 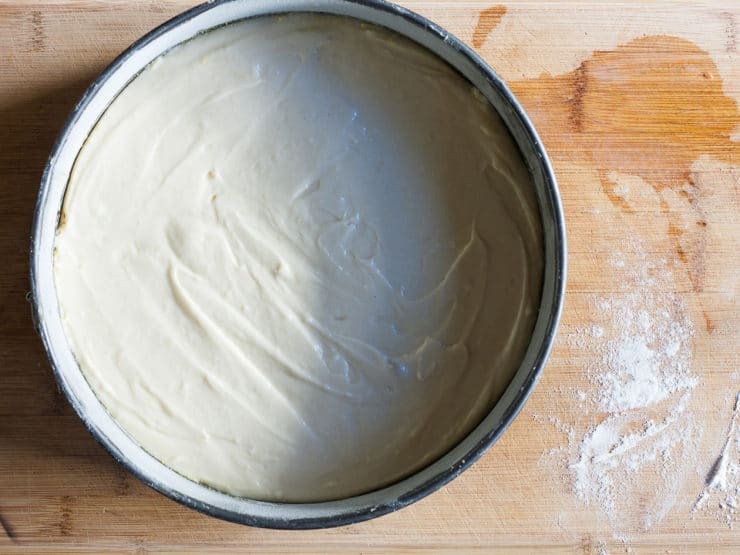 If using a springform pan, cut the cake horizontally in half. Place a cake layer on a serving plate, spread with the filling, and top with the second cake layer. Refrigerate while preparing the glaze. To make the glaze: In the top of a double boiler, combine the chocolate, sugar, and water and place over barely simmering water until melted. Remove from the heat and stir in the butter and vanilla. Let stand, stirring occasionally, until slightly thickened, 15 to 30 minutes. Pour the glaze over the cake, allowing a little to drip over the sides. Refrigerate until chilled. Boston cream pie is best the day it is made, but can be covered and stored in the refrigerator for up to 2 days. Remove the cake from the refrigerator about 20 minutes before serving. Boston Cream Cupcakes: Divide the batter between 12 (2½-inch) cupcake tins, filling no more than three-quarters full, and bake at 350°F (325°F for a convection oven) for about 20 minutes. After cooling, cut horizontally in half, fill with the custard, and pour the glaze over top. Richer Cake: In the batter, substitute 3 large egg yolks for the egg and increase the butter to ½ cup (1 stick/4 ounces/115 grams) and the sugar to 1 cup plus 2 tablespoons (8 ounces/225 grams). In the glaze, omit the sugar and water, increase the butter to ¼ cup (½ stick/2 ounces/55 grams), and add 1½ tablespoons light corn syrup. Decorated Top: Combine 1 cup confectioners' sugar, 1 tablespoon water, and 1 teaspoon light corn syrup. Spoon into a pastry bag fitted with a 1/8-inch round tip. After covering the cake with the chocolate glaze and before it sets, start from the center and pipe spiral rings. 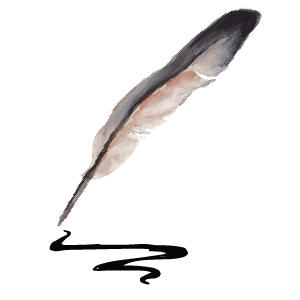 Using the tip of a knife or skewer and starting from the center, pull parallel lines outward to the edge. 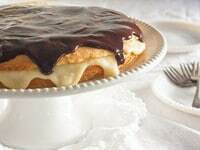 Thank you for this lovely recipe and the history lesson.I have never made a Boston Cream Cake before but am sorely tempted now.Thay have always been a favorite here but maybe now we can have a homemade one.Thank you so much!!!!!!! Amazing! My daughter’s moving to Boston so this seemed like the perfect dessert for her going away celebration. Our friends practically licked the plate after the last slice was served. Increased the cake recipe by 1/2 to give the pie a little more height. Highly recommend. Made this for Father’s Day. It looked great but the cake was too heavy and the glaze too sweet. Will look for a recipe that has a sponge type cake. The filling was good. Thanks for the history…very interesting. Absolutely fabulous cake! I did use the variations for a richer cake and was satisfied, and so were my guests. I will definitely make this again sometime! Boston Cream Pie is my dad’s favorite (and mine), so I tried this recipe as a surprise for his birthday. I’ve never made custard or a homemade cake before, but everything came out amazingly well. The only issue I encountered living at a higher altitude (Denver) was that the cake came out a bit dry, even after only baking for about 18 minutes, so next time I will take it out even earlier. Unlike some of the other reviewers, I think the amount of custard was perfect for this cake and the consistency was just fine. The flavors were all great and I will definitely be making this one again! Thanks for the recipe! I made the cake, filling, and glaze, exactly as written in the recipe (I used cake flour. I used vanilla extract. I had no rum but it is optional). I changed one thing during assembly by cutting each cake layer in half, making a four layer cake. There was just enough filling to give each layer a nice coating. The chocolate glaze turned out great. I love this version of BCP. Thanks for posting it. Too much custard for the size of cake, so I used some on top also. Then drizzled chocolate over top also. I was disappointed in appearance even though it had a very good flavor. Too much filling for just between the two layers. Was also too thin & ran out the sides even though i cooked to thick consistency. Very good flavor. Could have made 1/2 the amount. Tori, I thought you might like to know that over on Ravelry in the Cooking from Scratch group, we are making your Boston Cream Pie recipe during the month of March. We started a Cook-a-long for our group inspired by the King Arthur Flour Cook-a-long. I chose the month of March and your recipe for Boston Cream Pie or BCP as we are calling it. My mom cooked a lot from scratch all her life for all of her family. She died in November of 2016 and I wanted to make BCP in her memory, so I chose your recipe. This cake/pie was something she made often for her husband and three little girls. Mom lived to age 91, so we have lots of good memories of the meals she made for us. Thanks for the wonderful recipe, the story behind this dessert and helping to keep our memories alive. I have given you credit for the recipe on Ravelry. I found the pastry cream much too thin/runny – it did not support the top layer, and only a very small quantity stayed in the cake, most ran out the sides. The resulting cake tasted okay, but not good enough to make up for its poor appearance! Next time I will just make a trusty ol’ vanilla pudding for the filling. My first try turned out fairly decent, and I used 18% cream for the filling instead of milk. Will be doing another with a few mods this week. Thanks for posting. Will it print the whole recipe including directions with just text? Donna, if you press the red Print Recipe button it will create a printable version with just text. 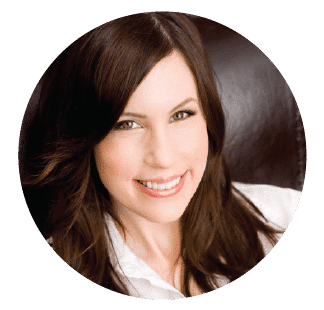 Another winning recipe from Tori! It was a lot of work, but worth it. I had a craving and no boxed mix or pre-made bakery item was going to cut it. My husband said it made him feel like he was in “Old Europe” while eating this, back when ingredients were simple and pure. I have to agree!!! There was extra custard so I set the cake right on top of it and the cake soaked it up nicely overnight. It was delicious the day I made it but even better the next morning (breakfast anyone?!?!). Thanks Tori, I’m going to keep trusting your recipes. Thank you Darcy! I have to give the late great Gil Marks credit here, this is his recipe. He was a treasure, I miss him so much! This was the dessert that was served to my husband and I on our wedding night at the hotel we stayed in. I have fixed Boston Cream Pie every year on our anniversary. We will be celebrating 43 years tomorrow, August 4th, and I am going to try this recipe. Thanks for the history……that’s very interesting and makes our “Anniversary Dessert” even more memorable. I was looking for a good recipe for BCP. It’s my husband and step-dad’s favorite, but I’ve never made one. My mom always cheats and makes one with instant pudding, cake mix, and canned frosting, Yuck! My husband got up early with our son today and drove him to an all day basketball tournament an hour away. I wanted to do something special for him! So, I decided to give BCP a shot. I will say that this recipe isn’t the easiest, but it isn’t hard either. I took a picture of it and sent it to my husband who’s still at the tournament and he can’t wait to get home and take a bite. I will say that my topping was a tad lumpy. I personally hate melting chocolate in a double broiler; it can go south quickly. When I make it again (I can already tell you it will be delicious), I will try melting the chocolate, water , and sugar in the microwave. Thanks for a great recipe! One of my favorites of all times. Yummy – Daddy really liked Boston Cream Pie, too!! I’m drooling, I love Boston cream pie! Ooooooh ooooooh YUM! My fave! i’m a Boston girl, and i’ve always loved this no matter what its origin!! Thank you for putting in the time and effort into researching a topic. I find it all fascinating. If you haven’t already, check out the Culinary Historians of Washington, D.C. I’m sure there are other groups like this, probably in metro areas, around the country. So many people with such great backgrounds. You, among them. I have to leave now to hunt up a vendor of BCP – I don’t have the time, ingredients to make it, but I sure am jonesing it. Omg I love this pie! It’s like a large eclair! 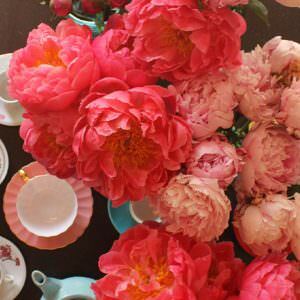 I’ll take my slice with a nice cup of green or white tea. Love BCP! Mom used to make it when we were young. Ah, memories. My mom always made this for my dad. He loved this desert. She once tried chocolate w chocolate filling it was good, but I prefer original!